The Kingston Barstool from Hillsdale Furniture relies on design elements that have been used in antique European and American furniture for centuries. The black leather and felt back rest outlined with brass tacks or nail heads is similar to Renaissance Revival side chairs, while the curved arm rests and molded edges recall Rococo Revival dining chairs. Hillsdale has combined these design elements that had a significant resurgence in furniture design during the middle 1800s with complete modern function and durability. So the look is prominent while the seating experience is contemporary, with a modern 360-degree swivel mechanism, as well as comfortable. 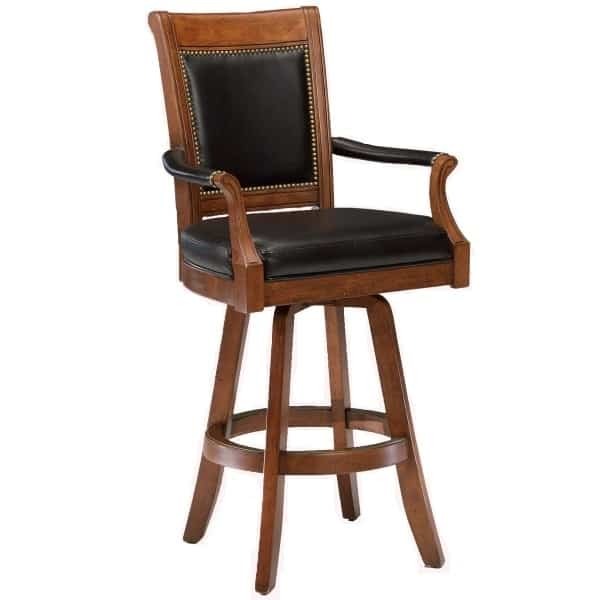 W 26" x D 23.5" x H 52" SEAT HEIGHT 31.25"